hello frank. | take your marks. go. I don’t know why, but it just seems to be a given that you name a car. Humans are huge fans of anthropomorphising their possessions. I had a hoover I called ‘Mac’, my laptop is ‘Edvard’ and then there was ‘Bertie’. Bertie was our old car, our English hybrid, a Toyota Auris who we loved dearly. He got us from A to G and really he was my first car, the first death machine I was legally allowed to operate solo. Leaving England meant leaving a lot of things behind and while leaving family was hard, we’d also grown attached to Bertie. Zac’s new job meant he needed a new set of wheels to get him from A to G but we weren’t expecting just how new those wheels were going to be. Let me introduce you to Frank. Looking super pleased with our new wheels – ceremonial bow not included. Not just my favourite Aussie brand of in shower coffee scrub, Frank is our shiny new (brand new), Toyota Corolla: hybrid, naturally. Frank wasn’t the car we were originally going to go with. 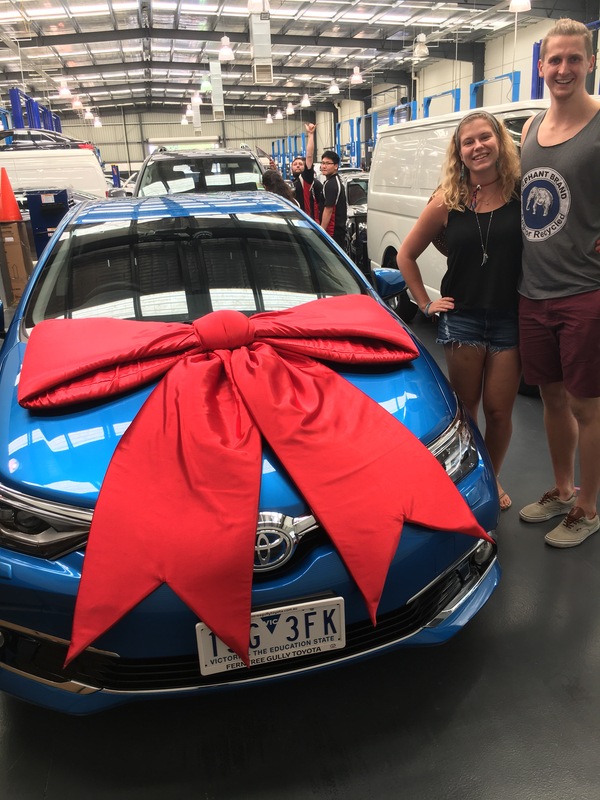 We’d been to look at used cars and not wanting to go home yet, we’d driven up to Ferntree Gully Toyota to have a look at what was on offer there. I’d needed the loo, so made a mad dash in to the toilets and left Zac to ask for a salesperson to show us what we thought we could afford. I come out and he’s chatting to a guy our age, who tells me we’d stumbled in to the new car garage, used was across the road, but he could show us some wheels if we were interested. When it came to it, yes, they got us. We were reeled in like willing fish, but if we’re going to be spending all that money, then why not spend it on a car that’s going to last, going to be reliable, going to be cheap to fuel up, cheap to insure, looks pretty snazz and down the track has decent resale value. We put a fair amount of km’s on our car (road trips, hello!) so why not have a car that can handle all that. Plus he was a dream to drive! We picked him up just in time for New Year’s and immediately took him for a spin down to Geelong to see friends there. Down to Eildon to see Zac’s sister and the kids, then over the other side of Victoria to Morwell to see his other sister and his nephews there. And the guys in the dealership were wonderful! They weren’t just trying to tell us the car, they really did look after us as well. ← 2016; an open christmas letter, for those near and far.